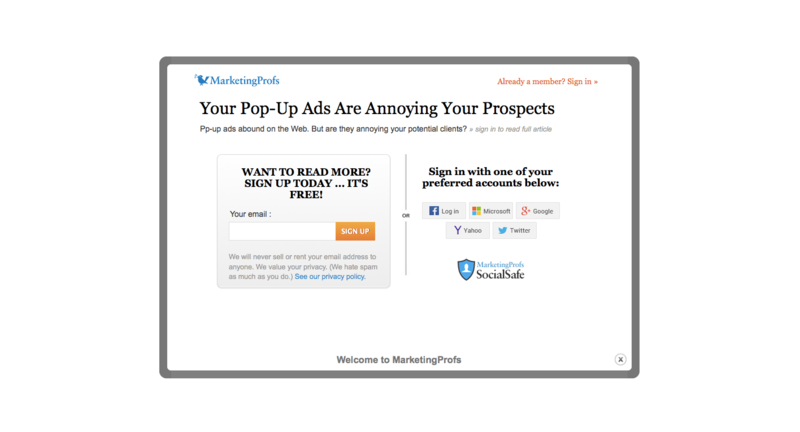 Pop-Ups: What Do They Do to Make Us Hate Them? Are pop-up ads questionable marketing campaigns? According to one study, they are considered the most loathsome of all digital ad techniques, with nearly every iteration and display technique almost universally panned. From the simple pop-up that covers your destination window, to the “clever” ad without a clear click away, to what can be accurately referred to as “Trickbait”, attempts to optimize the click-through rates of pop-up ads are receiving scathing responses, and may be leading swiftly to the downfall of the medium. The inquisitive marketing mind only need Google the marketing prospect to see the two most important and directly contrasting truths of pop-ups. People hate them. And when one considers but a paltry few of their common forms and the names we give them that accurately describe their presentation, it’s easy to see why. In employ, these schemes seem to generate clicks, but the experience for the consumer feels as slimy as it sounds in text. Take Trickbait, an old pop-up technique consisting of a magically moving window that lures the web surfer, while trying to kill the pop-up ad, into clicking the wrong window, the pop-up moving on its own accord at the last minute, causing the clicker to exit out of their intended browser. This digital chicanery is a detestable slight of hand one would think is only destined to cause damage to whatever brand thought it was a good idea, and you’d be right. We know from first hand experience while researching for this blog, when the Marketing Strategy site, entitled “Your Pop-Up Ads Are Annoying Your Prospects”, threw up this full screen pop-up upon arrival at the very article. Notice the small and unassuming placement of the X, all things considered a generous click away option by most pop-up standards, but notably in the bottom right hand corner, where English readers tend to look last on a page. After weighing the options, we decided to power through the hypocrisy and learn that one user study concluded that 95% of web surfers hate pop-ups. Another popular style, the “clever” Forceclick, is a full screen ad or video ad with no clearly discernible option out. These are as bad for the websites hosting them as the one trying to read what is happening underneath them, as the frustration this engenders in viewers significantly raises the likelihood that he or she will simply back out of the website all together to get away. And yet another trend that illustrates the virtual dirtiness of pop-up ad campaigns is what we affectionately refer to as the “Jump-scare” ad, when the pop-up appears to the immediate tune of its audio content, resulting in a jarring and unwarranted affront to the unwitting viewer. There are few reactions so visibly disdainful as the reactions expressed by people subjected to a pop-up ad. Many of their techniques are seen as tactless, artless, and forceful. In response to these techniques for aggressive ad insertion, ad-blocking software has seen a dramatic uptick in use, with some talks even suggesting that incorporating such software become the legal norm. Cases filed against ad-block software companies like Adbock Plus in Germany have failed, setting precedents that the way advertisers reach their audiences will have to change in the future due to their own actions in the past. As the advertorial has begun its meteoric ascent in the marketing world, the classic banner ad and pop up are quickly being edged out. Do pop-ups enrage you too? Sound off below, or tweet us @Connatix with your worst examples of pop-up sin!